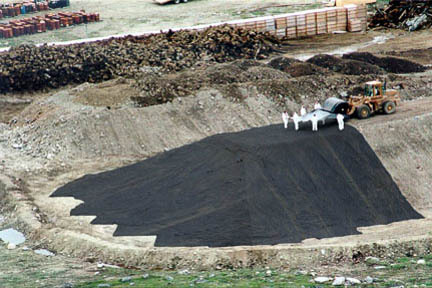 Layfield provides liners to put underneath contaminated soils for soil remediation applications. The liners can be used for either temporary or long term remediation with the long term use normally using a heavier lining material. Layfield also can provide covers, polyethylene film, and other geosynthetics that are commonly used in soil remediation applications. Layfield’s featured product for soil remediation is our OR RPE 25 geomembrane. This light weight, low cost material is ideal for temporary containment of contaminated soils. The oil resistant cover material of OR RPE 25 is resistant to a range of contaminants and is strong and light to withstand installation. Layfield also supplies lighter weight RPE materials for covers so that soils can be protected from rain during storage. For permanent soil treatment we also install heavy weight lining systems and double lining systems as are required in some jurisdictions.